Last month was my 34th birthday. It wasn’t a special birthday and not a particularly exciting year, but we celebrated it in Steamboat Springs Colorado. Steamboat Springs is one of our favorite places in Colorado. We got married here, we’ve had multiple friends get married here, and we love to escape the heat of Denver for some time in the mountains in the summer. In fact, when I began this post I was sitting outside beside the Yampa River watching it flow by. As I get more experience running a business, I’m beginning to notice life lessons all around me. I sat thinking about the day out fishing, and a few business lessons came to mind. So here you go, my business lessons learned from learning how to fly fish. I went fishing with Doug. While I’ve been fishing many times in life, I had only been fly fishing for a few days total and had never fished around Steamboat Springs. While I could have purchased a bunch of new gear, done a ton of research, stopped into the fly shop to ask for beta, and then searched for open water where fish might be biting, going with Doug meant that I didn’t have to worry about any of that. He showed me where to cast, how to hook, how to net, and how to figure out what flies to use. He even told me that he has peers with whom he goes fishing who teach him new things, even though he’s been fishing for 25 years. Whether you are starting your first business or have been in business for decades, you need a guide to show you the way. Mentor – someone who is 4-6 steps ahead of you in business who you don’t pay, but they are invested in you/your business (not monetarily likely) and an hour with them changes how you think about things and your business longterm. I am fortunate to have all of these and each of them serves an incredible purpose as well as allowing me to go deeper with quality people. While I enjoy fishing, it has a steep barrier to entry in terms of acquiring fear. You don’t need the best of the best from the start (or maybe ever, if we are honest), but even then once you add up a rod, a reel, waders, boots, and everything else you need you’re going to be out multiple hundreds of dollars. By going with Doug, I didn’t have to buy any of that. He had rods and reels already set up, waders and boots for me to wear, and even a full set of flies for us to use. If you’re dedicated to running a profitable business, then you need to watch your cashflow. This is true whether you are just starting out bootstrapping your business to get it off the ground and have it pay your bills eventually, or if you have a business with a team of employees. Sometimes it is worthwhile to pay money to save yourself other things (time), but that’s a tradeoff that must constantly be made. I’m a big fan of dreaming big but starting small. Want to life the affiliate business passive income dream? Then learn how to build a WordPress site, write content that ranks, build links, and drive traffic and conversions. Then start thinking about how to scale content creation/promotion/affiliate revenue. But don’t start thinking about “scale” before you’ve even started and are generating anything. I remember when I was starting my SEO career. I worked at agencies for the first 3.5 years of my SEO career, but that doesn’t mean we always had access to paid tools. We had some, but didn’t have budget for everything. So we got creative, with many of my coworkers hacking together tools in Google Docs that worked enough to do various things our clients needed. Part of it was out of necessity and part out of fun, but it taught me a valuable lesson that you don’t always need the paid tools to get the job done (though they can help take your game to the next level at points). I didn’t know the best fishing areas around Steamboat Springs and I definitely couldn’t have accessed the best uncrowded spots on my own. I also had no idea where the fish might be biting and where might not be crowded. By going with Doug, I was able to get access to private land that the shop leased every year to take their clients fishing. We had unfettered access to a mile long stretch of river where there were beautiful rainbows trout and other fish who were biting. I think during the day I hooked into about 20 fish and landed 12-14. It was all catch and release, but the fun is in the catching! If you go somewhere that the fish aren’t running either out of naiveté or because “no one else is there”, you’re going to get skunked. When you’re starting a business, having the passion to get it going isn’t enough. You can have all the passion in the world and fail because you started your business doing something that either no one needs or is not ready for. Just as in fishing and going where the fish are biting (even if it’s crowded), you need to start a business in a niche where people are ready/willing to buy. It’s amazing how many business mistakes a good niche can cover over so that the mistakes don’t kill your business as you build it. You don’t have to buy the latest and greatest gear, or pay a developer tens of thousands of dollars, to get started. You can hack your way to a super fun hobby, or a decent sized lifestyle business, with a lot of hard work, ingenuity, and getting a little bit lucky (the fish are biting where you go, you pick a niche that gets big quickly). But at some point, you’re going to have to invest. You can only borrow your guide’s or buddy’s gear for so long before you need your own. You’ll have to invest in waders, a rod, a reel, flies, and then you need to invest time researching, getting to spots, getting skunked, tying flies, and more. In business you can build a great business with some hacked together tools and building off a base someone else has set. You can start with cheap WordPress hosting and any old CMS to get a content business off the ground. But eventually you’ll need to invest in better WordPress hosting, build a professional site, pay for your email provider, and more. And that’s ok, as long as you’re making money and have the revenue to reinvest. Otherwise, you’ll have to get creative with ways to keep borrowing your buddy’s old rod. 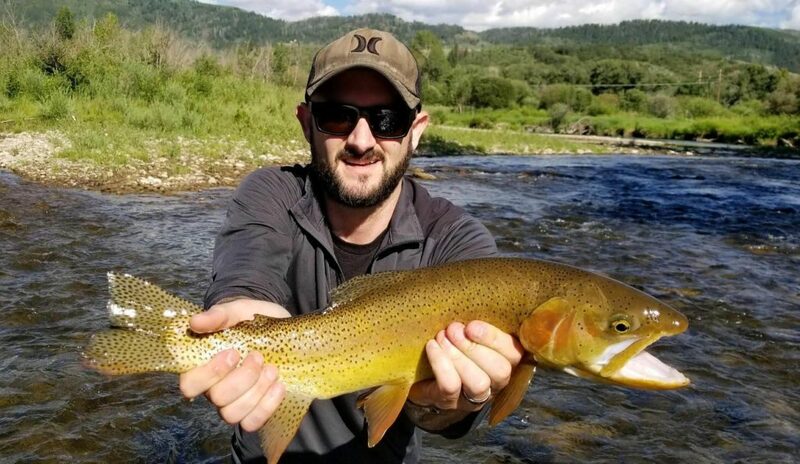 Fly fishing is a fun new hobby I’ve picked up, something I’ve been wanting to do as I attempt to have my year of no hustle and build a scaleable business that can run without me. What about you? What lessons are you learning from your hobbies as you build a business?